What’s it about? More than a delivery system for caffeine, coffee has been a highly traded commodity for centuries, generates wildly different sensory experiences based on engineering and chemistry, and, among its most devoted drinkers, inspires very humanistic rituals. Chemistry, economics, and history grind together into stimulating, beyond-Starbucks explorations in this First-Year Seminar. Who’s teaching it? Part professor, part barista, Joe Woo, assistant professor of chemical and biomolecular engineering. Woo has come a long way since sipping Chock Full o’Nuts, his father’s go-to brand that dripped into a Mr. Coffee carafe. “It tasted like boiled dirt,” he recalls. 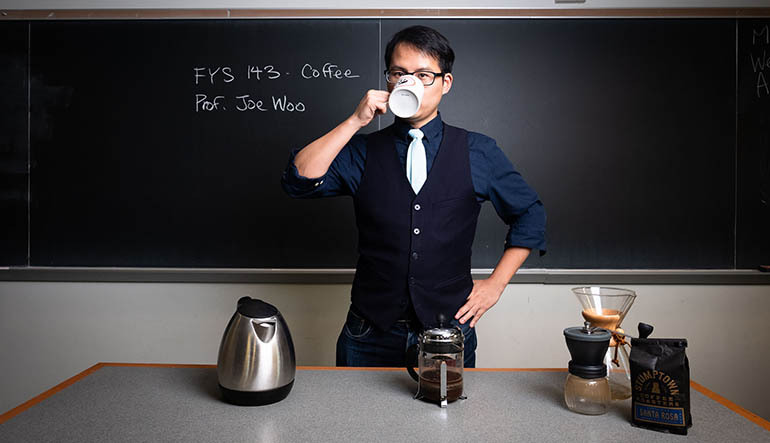 Joe Woo brews different roasts and samples beans from different continents as a multidisciplinary conversation primer at the beginning of each class. What’s on the agenda? Woo brews different roasts and samples beans from different continents as a multidisciplinary conversation primer at the beginning of each class. Throughout the semester, students in Woo’s class will learn about the economics of coffee in developing nations, roasting and flavor profiles, and coffee cupping, a spoon-slurping technique used by coffee buyers to check the quality of a batch of coffee. The class attended the New York Coffee Festival on Oct. 13. Tasters’ choice: Do you prefer a light, medium, or dark roast? Taste differences are the result of chemical reactions that occur at the molecular level in coffee beans at different roasting temperatures, Woo says. Breakfast of champions: According to the National Coffee Association, every day is coffee day for most of the country. Its 2018 report found that 64 percent of people in the U.S. enjoy a cup on a daily basis—the highest daily consumption in six years. Coffee is grown in more than 50 countries, and coffee represents a $200 billion industry in the U.S. alone. Social dynamics: Students in Woo’s class interviewed faculty and students about recent renovations at Cosmic Cup, one of two popular cafés on March Street, and how the changes influenced conversations, where they sat, and what they ordered. Legend has it … An Ethiopian herder named Kaldi observed perky, sleepless goats feeding on red berries from a certain tree. Kaldi reported back to a local abbot, who boiled the berries into a drink that kept his monks awake for prayer; the discovery shot up the Arabian Peninsula like a bolt of lightning. French press, with its vegetal notes, is a similar method of preparation to the original coffee brewed in Ethiopia, Woo says. And the rest is history: The French Revolution sprung from a café at the Palais Royal, and the June Rebellion of 1836 also was fueled by coffee. Coffee became the counterculture beverage of choice among tea-dumping patriots during the American Revolution, Woo says.